It's almost funny how much millet I'm eating these days. Funny, because prior to the The Whole-Grain Challenge the millet in our pantry wasn't getting any younger. In the past, my attempts at cooking millet yielded pots of mush that recall orphanage porridges of English storybooks: Neither attractive nor tasty, pushed around the plate even by the adults. [%image reference-image float=left width=400 caption="Puffed millet makes a 'weird but good' confection."] But the millet I've been eating lately has not been cooked in a pot of water; it's been stirred into cookies and shaped into confections. The latter I made from Lorna Sass's book Whole Grains Every Day, Every Way: In a large bowl, measure out two cups of puffed millet (look for this in the cereal section at the store; see photo), and a half cup each of currants and sunflower seeds. Melt eight ounces of good chocolate (bittersweet or milk), pour the chocolate over the millet mix, and stir until well coated. Shape into cookie-like confections and place on a large foil-covered baking sheet; cool in either the freezer or refrigerator until the chocolate hardens; serve cold. "Weird, but good" was the consensus. They reminded me of the cocoa haystacks my mom used to make, albeit chewier. The remaining two cups of raw millet in my pantry I vow to cook without sugar, but I could use some help with this. 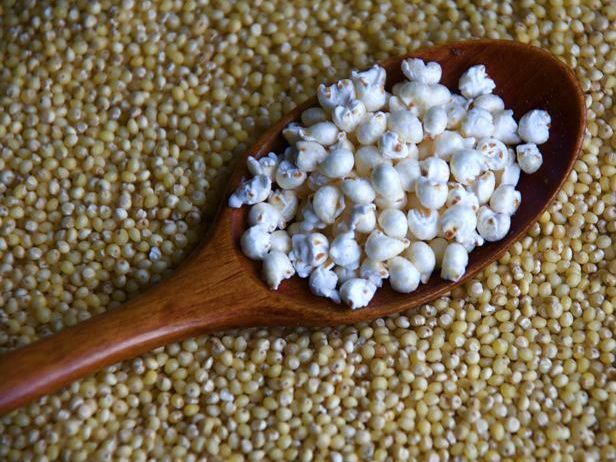 Do you have a recipe or favorite way to prepare millet?